Healthy cash flow is key to keeping your doors open and your employees paid. It’s also one of the primary factors that lenders are looking for when you apply for a small business loan. An alarming amount of profitable businesses end up failing because they run out of cash. So what can you do to avoid crippling shortfalls and panic-inducing dips into the red? Shore up your cash flow strategy with a little foresight and these five ideas for improving your cash flow. You’ve done the work or delivered the goods, so why are you still waiting to get paid? Extended payment cycles and overdue invoices can wreak havoc on your cash flow, especially when you’ve got your own vendors who are waiting to be paid. Fortunately, there are several steps you can take to get paid faster. First and foremost, invoice immediately after delivering your goods and services. While you’re at it, skip paper invoices for faster and easier-to-track electronic invoices. Better yet, use an online tool to automate your invoicing. One simple (and seemingly obvious) way to strengthen your cash flow is to cut costs. Start by taking a hard look at your recurring expenses to see where you can trim the fat. Are you still paying for insurance you don’t need? Services you no longer use? Outdated subscriptions? You know what to do with all of those unnecessary expenses. Even seemingly minor things can add up over time, especially when the costs are recurring. It’s also a good idea to take stock of old inventory and unused equipment. If you no longer need it, or simply can’t use it anymore, sell it for a quick and easy influx of cash. Could your cash flow use a little cushion? At some point, nearly every business experiences a shortfall for reasons that run the gamut. The key is to be prepared with cash reserves to keep your business on course until your cash flow gets back on track. So how much should you keep in your reserves? It’s a good rule of thumb to stash away at least three to six months worth of expenses. First, take a look at your cash flow statements for the past six months and calculate your average monthly expenses. Now multiply by at least three — and don’t touch that cash! Maximize your reserves by keeping the money in an interest-earning account. While cash reserves are an excellent insurance policy for cash flow fluctuations, it’s also a good idea to be prepared for the unexpected with a line of credit that you can access when you need it. Chances are, you’ll be in a much stronger financial position to secure a line of credit before you’re feeling the pinch and actually need it. Qualify now and you’ll be prepared for those tight times, when your business likely wouldn’t qualify for financing. Establish a relationship with lenders now and consider securing a line of credit against a percentage of your accounts receivable or inventory, both of which will serve as collateral. Available funds from this revolving line of credit will fluctuate as your accounts receivable and inventory do the same. A solid cash flow management strategy begins with analysis, but that doesn’t mean you have to spend endless hours filling in a spreadsheet — or blow your budget hiring a bookkeeper. These days, intuitive online tools are available to do the heavy lifting for you. Beyond helping you get a handle on the movement of your money, tools like FINSYNC can also help you automate your accounting and other back-office tasks. And when it comes to analysis, these intuitive cash flow tools can help you visualize your past, present and future cash flow with charts and other graphics. Online tools make it easy to forecast future cash flow so you can time your accounts receivable and accounts payable to ensure that you have access to ample cash when you need it. 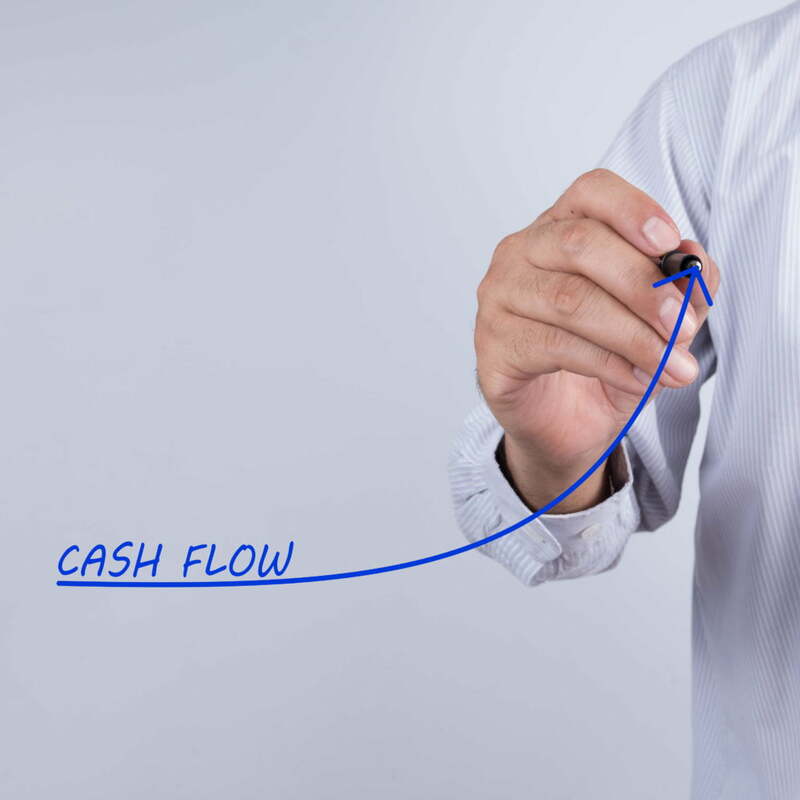 Is managing your cash flow really that important? In a word, yes. It’s impossible to control what you don’t measure, and gaining better insight into your cash flow will not only keep your business up and running, but also help you qualify for financing when you need it.